Collaborative robotics advance production line efficiency and reliability by improving working conditions and allowing operators to handle tasks with higher added value in a safe working environment. It also minimises mistake rates due to high automation. Leveraging the advantages offered by cobotic solutions in terms of compactness and flexibility, Gebo Cermex is introducing CoboAccess™_Pal. 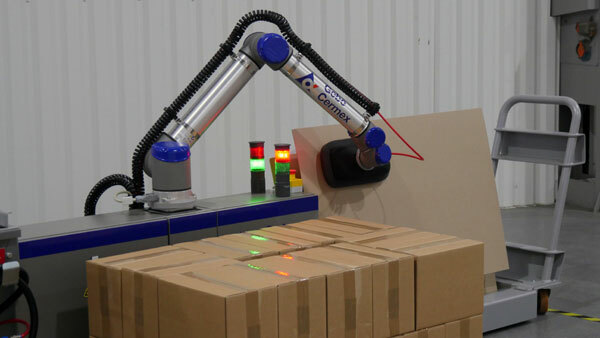 This robust cobotic palletiser is particularly suited for low-speed applications and underlines the company’s commitment to help producers embrace Industry 4.0 opportunities. Today, collaborative robotics, or cobotics in short, is a popular topic in the automation and manufacturing world because of its obvious advantages: these newsolutions are easy-to-install and -operate in tight production environments, since the collaborative mode is safe for human interactions and lets manufacturers build cells without physical fences around the machines. Gebo Cermex, part of the Sidel Group, is an expert in palletising/depalletising solutions with more than 5000 machines installed around the world and more than ten years of experience in driving the implementation of collaborative robotics in end-of-line solutions.Designed to handleRegular Slotted Container (RSC) and wrap-around blanks and to complement low speed production lines, CoboAccess_Pal embeds Gebo Cermex’s high safety and industrial standards. This ultra-compact, fenceless palletising cell is designed to perfectly match the needs of very demanding production environments, where reliability is absolute key. This automation platform contributes to maximum operator protection and total care of products, as case handling is always performed above the conveyor or the pallet station, which ensures that cases never fall on the floor or on working staff. To minimise risks for operators, CoboAccess_Pal’s gripping tool is composed of foam to soften its surfaces when in contact with workers and to prevent injuries during maintenance interventions. In addition to its high safety standards, CoboAccess_Pal maximises uptime through connectivity and a high level of intelligence. The cobotic palletising cell includes the new Gebo Cermex user-friendly HMI based on an intuitive tablet approach navigation. Available via the HMI, the Pal Designer® configuration and simulation tool allows full pallet management with the possibility to modify, simulate and create pallet patterns autonomously, in less than two minutes. For enhanced maintainability, Standard Operating Procedure (SOP) and One Point Lesson (OPL) functionalities are all accessible via the HMI to facilitate assistance for operators, trouble shooting and root cause analysis. Thanks to its ultra-compact, fenceless cell and the flexible layout that can be customised according to specific site constraints, the solution features an optimised footprint. Designed with ease-of-use, ease-of-installation, and ease-of-configuration in mind, CoboAccess_Pal can be quickly implemented by the operator onto another line due to its unique Plug & Play features. The entire palletising cell is easily adaptable and portable, so that it can be moved from one line to another effortlesslywith a manual pallet jack, making the whole production installation even more automatic, flexible and – in the end – efficient. Editors Note: The images within this document are for illustrative purposes only and should not be used for reproduction. If high resolution copies are not attached with the document, please contact Katherina Riesner at F&H Porter Novelli for copies – see contact details below. Gebo Cermex CoboAccess_Pal is certified by Apave. Less than ten minutes are required for dismantling and reassembling.